We've been waiting for this watch for some time and it's here! This is a brand new model from Sinn, and this watch is not even shown on the Sinn web site. 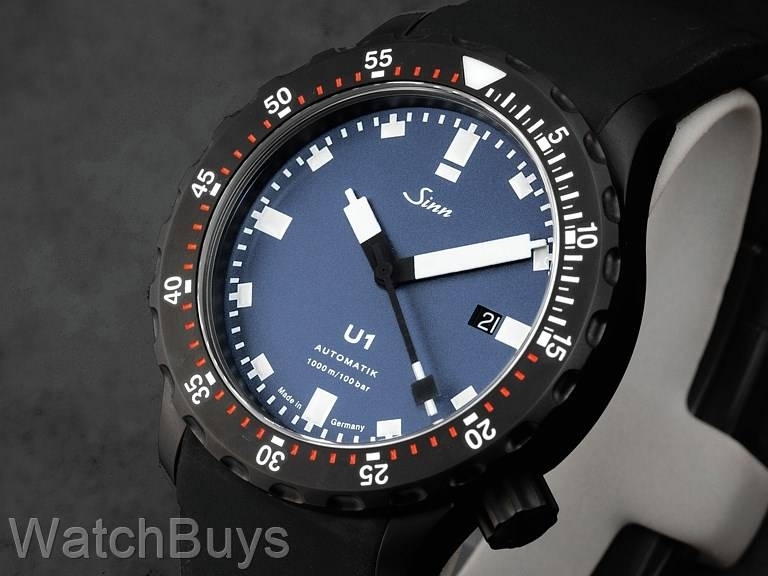 We asked Sinn to create a Sinn U1 Blue using a fully Tegimented black PVD /DLC case and silicone rubber strap with black hardened buckle, and the combination of the matte blue dial with the matte black hardened finish is a knockout. In German, the word for "black" is "Schwarz" hence the "S" in the title of this watch. And there's just enough red in the milled 45 minute indices on the bezel to give this watch some pop. 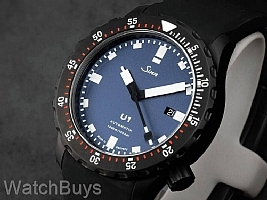 Introducing the all new Sinn U1 Blue Fully Tegimented Black (that's a mouthful). Several guests at our recent Road Show events in New York and Chicago spotted this watch hiding among the many other Sinn watches and immediately asked us "what's that"? Knowing that it would not be available for some time, we kept quite. Now that the finished product is available for immediate shipment, we are amazed at how this watch turned out. The new Sinn U1-S Blue on black PVD Tegimented bracelet features the same great case design made in-house from German submarine steel at Sinn's case making facility in Glashutte, Germany. The combination of the submarine steel and fully Tegimented case create superior scratch and corrosion resistance. And unlike watches made with standard stainless steel, this watch case does not need to be rinsed with tap water with each exposure to a salt water environment since it is made from true submarine steel. The uni-directional ratchet operated rotating bezel is also milled from the same submarine steel as the case and is likewise Tegimented and PVD coated. The indices are machined directly into the bezel without the use of bezel inserts, which can corrode or come loose at deep depths. The international testing lab of Germanischen Lloyd has tested the Sinn U1-S Blue on bracelet, and determined that the watch can be certified as water resistant to 1,000 meters. This same firm tests submarines for their ability to withstand the effects of underwater use. This watch is fitted with a Sinn black silicone rubber strap with a fully Tegimented black locking diver's clasp.